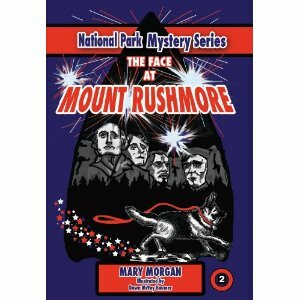 “The Face of Mount Rushmore” is the second book in Mary Morgan’s “National Park Mystery Series.” The Cooper twins, Ben and Bekka, are excited about an uncharacteristic request from Uncle Paul to join him for a 4th of July fireworks celebration at the Rushmore National Monument in the Black Hills of South Dakota. Excitement is in the air as preparations are made for a family vacation of camping along their way to meet Uncle Paul. Bekka keeps the family up-to-date on what to expect as she quizzes them with important “For Your Information” (FYI) quizzes, using her tour book as a source of reference. As they near their destination plans are made plans to pan for gold at the Thunder Mountain Gold Mine; dig for dinosaurs, follow the 1874 expeditions of Colonel George Custer, to hike along the Presidential Trial, and to check out the Junior Ranger experience offered at the Rushmore National Monument. Ben was stunned when he overheard two suspicious looking men alluding to a cryptic plot to detonate dynamite at a time when the fireworks would muffle the sound of an explosion. Tension continued to heighten as the mystery unraveled and the intrigue continued to build to a “dynamite” conclusion. Morgan’s unique writing style, genuine characters, and love for story provide the preteen reader with elements of adventure, history, and family values, using a balance of humor, entertainment, inspiration, and informative data. “The Face of Mount Rushmore – National Park Mystery Series” should be on the reading lists of elementary school, church, and home school family libraries. Preteen readers will enjoy each mysterious adventure in the series. Highly recommended. 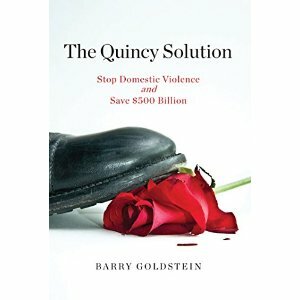 In “The Quincy Solution” Barry Goldstein alerts the reader with a new awareness of the extent of the problems created as a result of the attention given on sexual violence wife and child abuse in the home and of the need for reformation our legal systems, investigative practices, and in prejudices in courts custody decisions. Goldstein provides a brief background and history of domestic violence, inequalities between the sexes, and the lack of calling on expert testimony by the courts and the prevailing sense of “it can’t be changed” revealing how we live in a society that ignores or tolerates rather than protects the victims of domestic violence. He goes on to introduces the Quincy Model which focuses on risk assessment and victim safety in cooperation with law enforcement personnel, the courts, and experts in the field of Domestic Violence. Quincy, Massachusetts, a Boston suburb, in Norfolk County became alarmed by the rate of homicides directly related to domestic violence cases. This led to the development and implementation of a model of best practices which dramatically reduced these homicides annually. Goldstein writes with clarity is fervent, articulate and comprehensive. He presents compelling case studies with analysis leading to conclusions worthy of consideration and putting into practice. “The Quincy Solution” is timely, relevant, must reading for judges, lawyers, and Domestic Violence evaluators. A complimentary copy of this book was provided for review purpose. Opinions expressed are my own. 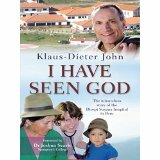 Klaus-Dieter John relates the story of God’s call on his life as a teen ager. He goes on to tell of his amazing journey in answering that call: which includes medical school in Germany, meeting his future wife, Martina, and of their shared vision of becoming missionary doctors. Step by step John describes God at work in his life through answered prayers, intervention in crisis, and what he chooses to call “miracles,” from minute to gigantic. John and Martina traveled the world during their medical training and career as surgeon and in medical work; ultimately settling in the Peruvian Andes to work among the Quechua Indians where they founded the Diospi Suyana Hospital. Exciting color photos reveal the magnitude of the undertaking in an area of extreme poverty. Klaus-Dieter John’s writing is moving, with an action story line. He draws the reader in through compelling real life stories that result in a sense personal involvement evoking compassion and inspiration. I found myself deeply touched and highly motivated to step up to the plate, take action steps to recognize God at work around me and pursue his purpose and plan for me with vision and compassion. “I Have Seen God” is must reading for anyone with a desire to know more of the reality and power of a Living God. I can highly recommend this book to family and friends knowing that it holds the power to change lives.